We have a new composer! Murray Gold has been turfed out via the back door and new guy Segun Akinola has been drafted in to not only compose the incidental score but also put a new theme together. Best of luck! More new Torchwood is on the way as Big Finish announce Series 6: God Among Us, a new audiobook from the BBC, The Caves of Androzani, read by Peter Davison is due for release this November and also coming this November, a new documentary DVD from Reeltime Pictures: The Doctors: Villains! Snarly aliens, shady laster tag owner and plenty of investigatory action all feature in this story. We’ve been big fans of SJA thus far so does this one keep the momentum going or are we fooled into a false sense of security like Kudlak and his AI Mistress? Thank you for joining us for 193. Next week it’s classic Who and the Seventh Doctor is back for Dragonfire. Have a grrrrrrreat week and until next time – Allons-y! This year’s San Diego Comic Con will see the first panel featuring the new cast and producers from the new series of Who. Can we expect a trailer? The fan fiction book The Temporal Logbook II: Further Journeys is out now with all proceeds going to charity; Robert Harrop preview the Second Doctor and K9 and the Series 11 dvd and blu rays are already up for pre-order! Often viewed as a cool story within a mediocre series (not our opinion of course), it’s about time we tackled this creepy two-parter. An enjoyable one or are we watching through the gaps in our fingers? Thank you for joining us for 192. Next week we’re back to The Sarah Jane Adventuress and Warriors of Kudlak. Have a great week and until next time – Allons-y! Australian comedian Rob Lloyd is taking is Who-themed comedy show Who, Me. tour across the UK. A collection of the Lethbridge-Stewart novels from Candy Jar Books are available for free this weekend on Kindle, there’s new Who Talk commentaries for The Massacre and Revenge of the Cybermen and Eaglemoss are offering 17% off for Fathers Day with code FATHER17. We’re loving the excuse to watch Torchwood as we review these stories. Ghost Machine certainly has some dark undertones but is it entertaining enough to keep us engaged or do we switch off and watch Ghostbusters instead? Thank you for joining us for 191. Next week it’s modern Who and that cheeky Tenth Doctor is back for our review of The Impossible Planet. Until then have a great week and until next time – Allons-y! All of Who since 2005 is on iPlayer, Big Finish makes their first steps towards digital-only releases and the BBC close the legendary Maida Vale Studios. Jenny – The Doctor’s Daughter out now from Big Finish, the 10th Doctor story Infamy of the Zaross is coming on vinyl as an HMV exclusive and we bring you the details regarding Class coming from Big Finish this August. We put this story off last month but it’s back and the Fourth Doctor and Sarah Jane are ready to get stuck into this sort-of-historical. It’s wizardry and superstition vs science in this series 14 four-parter. We into this or are we pulled down by Mandragora Helix energy? Thank you for joining us for 190. Next week it’s the Torchwood story Ghost Machine. Until then have a great week and until next time – Allons-y! I’ve been looking forward to a 7th Doctor series from Titan. Over the past few years, we’ve had decent releases featuring, at first, the modern Doctors until they ventured into classic territory with the likes of the Fourth and Eighth Doctors notably. 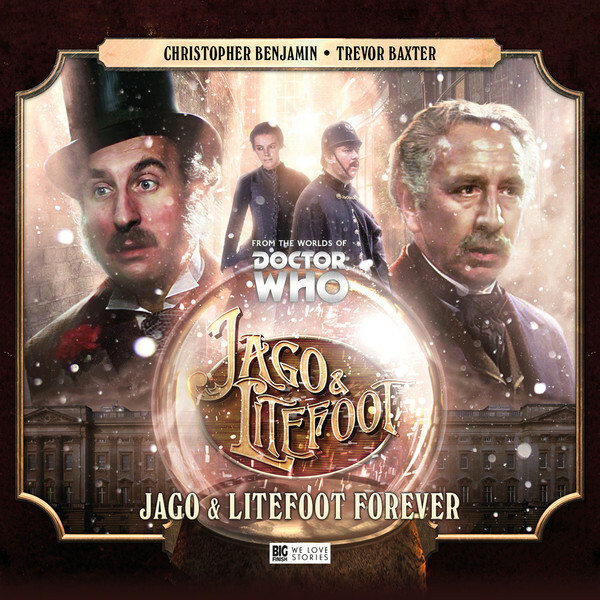 I’ve grown to love the 7th Doctor and, coupled with news that two writers from the classic series itself, Andrew Cartmel and Ben Aaronovitch would be running the show, it’s great to finally get the story. The main characters are, as you’d expect, right here to enjoy and seamlessly plucked straight out of McCoy’s tv era. The Doctor and Ace are presented to us in a way that feels at home with the tv show. It “feels” very Series 25. Andrew Cartmel is on writing duty and if you’ve watched McCoy’s era plenty of times you get the same feel from this that equals his overseeing of the show. Although the medium sometimes suggests you need to be direct and in your face, Cartmel’s story is mysterious and timey-wimey. It has a sense of intrigue that made the classic series fun to watch with the Doctor playing the investigator with aplomb. Although this is a double-issue in terms of single comic releases, Cartmel manages to take us to different places in space and time with ease and you get a sense of “this feels timey-wimey but I can’t wait for the next issue”. I’m not left feeling my brain has been taxed too much but I feel like there a lot more to this story. Although there are no high-impact action scenes (with the exception of a small case of fisty cuffs involving Ace) the level of suspense builds. There’s a lot of elements here that make a crackin’ Who story; mysterious alien ships, military units working alongside the Doctor, conspiracies, controlling alien snake-things and a sprawling story. The story kicks off with Ace, in 1967, about to burn or destroy something that we’re not yet privy to. We’re then thrust to 2029 where a team of astronauts come across a huge alien craft that also pops up in the story as the reason why the Doctor is summoned to help Group Captain Gilmore. Fans of Remembrance will know him well. He’s driving the military aspect of the story and his stern attitude and no-nonsense approach is instantly recognisable. Other characters include Prof. Rachel Jensen, also plucked from Remembrance and provides the scientific aspect, Australian and British military and a suspect looking Aboriginie. The idea of two time zones (1967 and 2029) linked somehow by a central character (Gilmore) makes you want issue 2 to hurry up and get here. As mentioned earlier, seeing the Doctor and Ace team up with Gilmore does have shades of The Doctor and the Brigadier about it. The “supporting cast”, as it were, consisting of military and Australian locals, all seem to move along with The Doctor as you’d expect. What turns out to be a mission of mystery is soon rumbling along nicely thanks to The Doctor and his alien tech, mesmerising the other characters. The Doctor and Ace have been written perfectly into this story. For the most part, they’re not actually in it as much as you’d expect. This is what encapsulates Cartmel’s wring and Aaronovich’s production. This isn’t something The Doctor has instigated. It isn’t one of those stories that sees the TARDIS land somewhere and The Doctor’s “spider senses” going off with the smell of something not being right. The Doctor and Ace were requested to assist by Rachel and Gilmore. They are along for the ride for most of the story, allowing the events to unfold. It isn’t until the story picks up halfway through that The Doctor steps up and takes charge. His little quips are spot on and Ace oozes her usual street-cred intensity. It’s definitely a comic where the voices of the actors from the tv show sound perfect in your head as you’re reading. Artwork provided by Christopher Jones is for the most part doing the business. The likeness to the main characters is pretty much all there, especially The Doctor and Gilmore. Ace is mostly there but something about her character art I feel isn’t quite nailed. Also, I would have liked to have seen something a bit more adventurous with panel layout as it seems a little paint by numbers at times. For the most part, it’s very well done though and satisfies lovers of McCoy’s era. Overall this first step into The Seventh Doctor’s world from Titan is a success. Cartmel and Aaronovich seem to have stepped backed into writing stories for McCoy like it was yesterday. The slightly slower pace coupled with the spot on writing for the main characters makes you feel like this could have been a legitimate episode(s) slotted into Series 25 or 26. I’m really looking forward to part two. 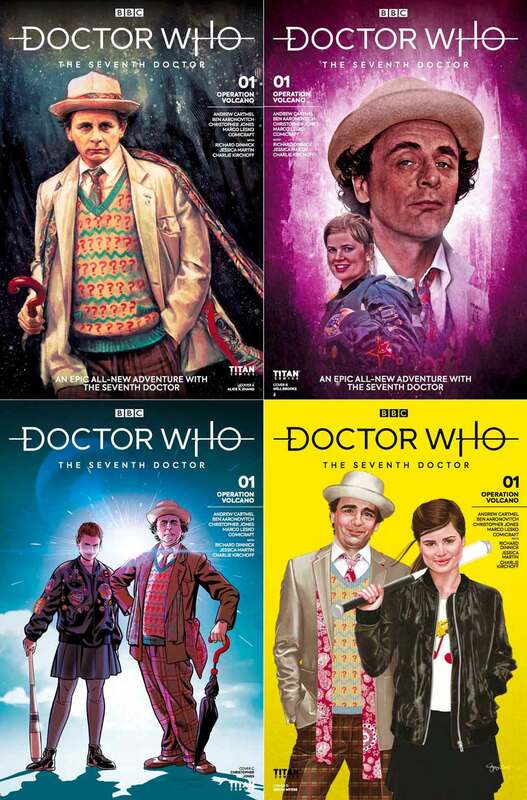 The Seventh Doctor: Operation Volcano – Part One is on sale in the UK on 6th June from Forbidden Planet. Hey, Who fans! I’m joined by a special guest co-host this week… Phil from the Who’s He Podcast chats all things Who and Sarah Jane so a big thank you for stepping in. Go and check out Phil’s show now (site, iTunes and YouTube), a fabulous Who podcast that’s we’ve listened to for many-a-year. 500 episodes from Classic Who, starting with An Unearthly Child, kicked off on Twitch this week and Class is returning this August via Big Finish featuring Ace! Fan made ezine Whotopia issue 32 is out now and issue 526 of Doctor Who Magazine featuring Tom Baker drops this week. We’re back on to The Sarah Jane Adventures this week. More of an adult-themed story this one. Does it affect our good run of positive reviews or are Phil and I feeling a little nunned off? Thank you for joining us for 189 and to my special co-host Phil from the Who’s He Podcast. Next week we’re looking at the 4th Doctor story we were meant to cover last month – The Masque of Mandragora. Have a super week and until next time – Allons-y!